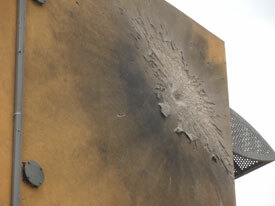 This past week the last scar from last summer’s war with Hamas was repaired and covered up. Today you would never know this building took a direct hit from a terrorist’s rocket. With a fresh coat of paint makes it looks like nothing ever happened; I wish we could say the something about the people of Sderot. Yes people are out and about and there are smiles on their faces and everything looks like everything is normal but its not, let me explain. as the Tseva Adom alarm went off the same old adrenalin rush happened. For the next few days people were talking about the alarm and wondering if this was the beginning of the next round of attacks. Last week I had an opportunity to take some supplies to the solders that patrol and protect the Sderot – Gaza border with four other people. While we were at their outpost we heard that same “click, click” and as we looked to one another you could see that same momentary panic look on our faces as we sough out were to run to and hide. 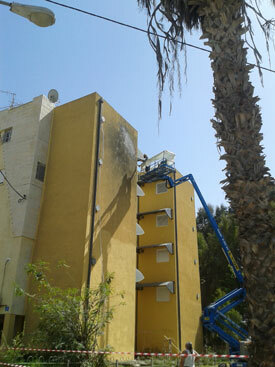 After the war Sderot received state money for infrastructure improvements and beautification. The new and improved parks are beautiful as is all the artificial grass that has been installed through the city. 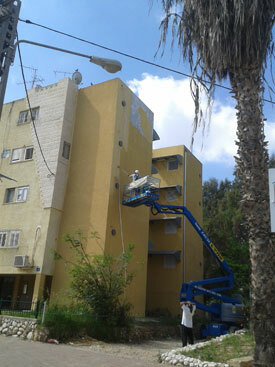 How I wish it was that easy to help the people of Sderot…a little paint and some artificial grass but its not that easy. Employment is still an issue. You can find a part time minimum wage paying job but at 23 NIS it takes two hours just to buy diapers for your baby; you need deodorant, that will take you a hours work; on a good day a whole chicken will take you almost 2 hours of work; a bottle of coke will cost you an hour and don’t even ask about going out for pizza . How I wish we could close our door because we weren’t needed or we never had to send a newsletter asking for your help but we can’t. Single mom still need our help , kids still come to school hungry and senior citizens on fixed income still look to us for food and incontinence supplies and there are still the working poor struggling to make ends meet. Just because you see a smile on someone face or a beautiful town or a fresh coat of paint, please don’t be fooled… we still have work to do and there are still people who need our help and still need your love, prayers and support. Through your support we are able to help and make a difference in peoples lives. Would you or maybe your group, organization or club be willing to help those we serve? If so please click here to help make that difference.